Hey everyone! I am currently in a photography contest that ends in two days. The contest is vote based, so here I am, trying to get a vote out of you guys. It’ll only take a moment of your time, and your email address. All you need to do is click the link below. Your vote would mean the world to me! If I were to win, I would have an exhibition in NYC, a cash grant (maybe I can finally get a camera that isn’t trying to die on me…) and a TRIP AROUND THE WORLD HOLY COW. There’s still some time left if you want to join in on the competition too! (: So go ahead, click the link, and check it out! I just really, really love photography. When I signed up for my photography class in high school, I had no idea that I would fall so in love with it. If you asked 15 year old me what I would be doing as a career someday, the word “photographer” would have never escaped my lips. My passion for this craft has become so deep, I sometimes feel ill. Sometimes there’s this crushing weight on my chest when I can’t seem to get it right, when I can’t edit something just the right way, when I have no idea how to translate something from my mind to the lens. Sometimes when I see people who are younger than me producing work that is mind-blowing and creative and filled with wonderful technique I just want to curl into a ball. It gets painful at times because the thought of quitting never crosses my mind. I know how I have to keep going, and sometimes that’s scary. I can’t focus on things. When people are talking, my mind wanders. I think of props, places, people, costumes, compositions, series… Instead of paying attention in classes, I make lists. When I’m not thinking about anything in particular, my mind wanders and somehow ends up on photography. When I’m on the computer I have my wordpress, my fb page, lomography, flickr, and tumblr open. I’m always looking for inspiration, trying to find out new things I could try. Tutorials and experiments are a few of my favorite things. Sometimes I sit back and think, “I’m doing a good job.” and other times I say to myself, “You’re terrible. This is no good.” When I see something someone did and I don’t know how they did it, I try and try and don’t stop until I know how they did it. I want to be good fantastic. I know I could be. It’s hard to have this sort of passion and no one to share it with. I wish I had close friends who were fanatics like me, someone who I could bounce off ideas with and talk the lingo and figure out new things together. Because, sometimes, I don’t think the people around me get it. They just look at my pictures and say, “Wow, this is really great!” They don’t see the hard work, the sweat, the hours of photoshop. They don’t see the layers, the developing, the anticipation of waiting for prints. They don’t know. And I want someone who does. I want someone who will kick me when I’m comparing myself to others and remind me I don’t have time to waste. I’m not going to stop trying. I’m young and ambitious and I dream big. I may not have the resources that fantastic photographers my age have, but I have a lot of heart. Sometimes people say that’s not enough- but they haven’t met me yet. I’m going to get it right. I’m going to pick myself up off the floor when I can’t fathom how people can be so talented. I’m going to keep trying and trying until I can get the lighting just right, until I can make that surreal image look crazy enough. I’ll keep learning about photography and all the things it has to offer. I’m going to be one of those names that photographers bring up in conversation. I’ve been trying so hard, and not for naught. This past year alone I have improved at an incredible rate. I might not be where I want to be yet, but I’m getting there. I started this blog, I update my facebook page weekly, and I just started using my flickr more regularly. I’m getting my stuff out there- I mean, here you are, someone I don’t know, and you’re reading my blurbs and looking any my work. That makes me ecstatic. So, when I’m out there trying my hardest and getting discouraged and getting inspired and not quite making it but almost making it, I will remember why I love this craft so much. I love it because I can’t stop. This summer I have been on a journey. 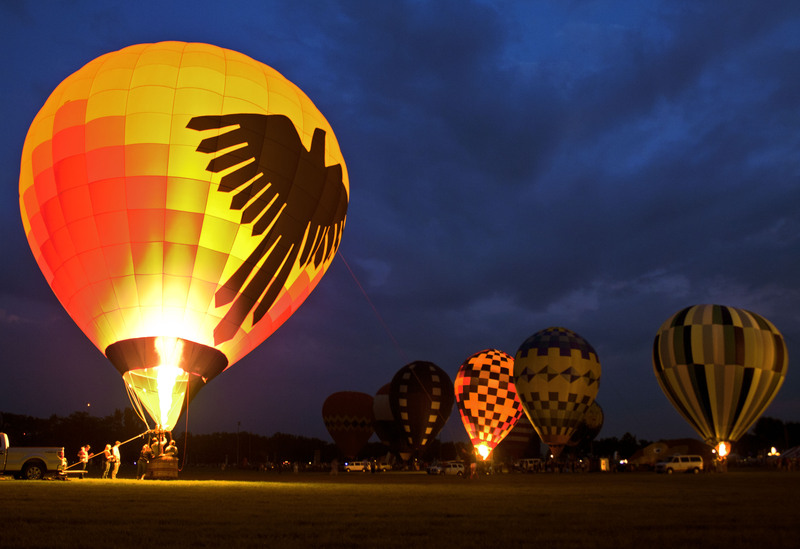 It all started when my mother heard about a hot air balloon festival in Howell, MI. We had no idea what we were getting ourselves into. 1.) I’d never actually seen a hot air balloon in person. 2.) I was going to get some awesome photos. I was like a little kid on Christmas morning (or a poor college student on Christmas morning whose parents just bought them a new coffee mug… we could go with that, too.) I’m sure you could understand my disappointment when they cancelled the hot air balloon flight because winds were at 9MPH. We drove home disappointed. However, my disappointment was short lived: I took to the internet. The next one we could go to was in Jackson, MI. We now knew that ideal conditions were under 9MPH, and there could be next to no chance of rain. We got this. We were prepared. We were going to check the weather conditions before we went out for a long drive to go see some big balloons and go snappy-snappy. Yeah, there was a tornado warning the day we were gonna go. BUT I WAS STILL DETERMINED. There were no more festivals in Michigan. Ohio was another story. Our sights landed in Findlay, Ohio. We invited my friend, Kaiden, to come with us. I watched the perfect weather all week. We were finally going to see some hot air balloons. It was going to be a sunny day with 0% chance of rain and winds at 5-6MPH. Thank you, National Weather Service. Why am I so thankful? Because I’m being sarcastic. We drove all the way to Findlay. It was cloudy and suspicious looking. And windy, very windy. When we got there it started to sprinkle rain. This was at 4:30PM, but we figured we’d wait it out, since the launch was at 6:00PM. 6:00PM came and went. At least there’s the balloon glow, at 8:30, we figured. There were hundreds of people still there being determined, so we thought we’d wait it out too. However, hot air balloon pilots with their baskets attached to the back of their trucks were leaving. Were they going to have the balloon glow? Am I ever going to see these giant balloons? Or are hot air balloons some elusive myth, similar to Big Foot or The Loch Ness Monster? I was beginning to believe that finding good ‘ol Nessie would be easier than finding a hot air balloon. It was cold, windy, and rainy- just like my discouraged soul. Kaiden and I went to the car to grab our hooded shirts to keep warm and to move our legs, for we had been sitting on the grass for many an hour at this point. Sore and tired, we returned to our blanket. While we were gone, they started blowing up the remaining balloons. A worker was driving around on a golf cart and stopped next to where our blanket was because a photographer had his gear all set up (he had some nice gear- there was a lens he had that would cost me a kidney,) and offered him a special pass to go out on the field to take pictures up close. Thank God for mothers. My mom stopped the person in the golf cart and said, “Hey! I have two photography students with me, can I get a pass?” AND SHE GOT ONE. So imagine our faces when we came back and not only were there balloons (turns out they’re real I guess,) but we had special access to go near them. We got our pictures though and had to leave the field pretty quickly, but we were satisfied. Kaiden and I got some really great shots, and I managed to somehow get a panorama. Perhaps the hot air balloon gods felt sorry for all my traveling and well-wishing and decided to finally cut me a break. I also snapped some on my film camera with Revolog Texture film, but those aren’t developed yet because I haven’t finished the roll. Those should be coming soon. I learned a lot from this experience: plan ahead, hot air balloons are almost like unicorns, and having a mother like a honey-badger comes in handy. Next summer I hope to see hot air balloons in the air, but for now I’m pretty satisfied with them glowing on the ground. The Detroit Packard Plant is the world’s largest abandoned factory. I have the pleasure of living about twenty-minutes away from it. Quite a few people from my area like to frequent the “Packard”, some to take pictures, some to explore. I’ve heard about skits being performed there and even mini-concerts. It’s pretty cool. The building is so large and vast it would take several visits to see it all. Covered in graffiti and a consistent dumping ground for large objects, visiting the Packard is a new experience every time you go. You never know what you’re going to find. This was my first time visiting the Packard. 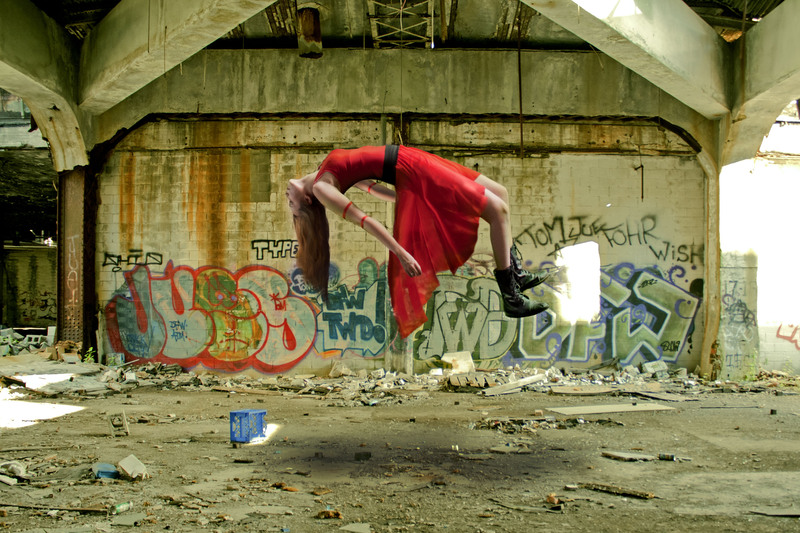 I had a shoot I wanted to do as a part of my Pleasures of Levitation series, so my friends and I wandered around a little bit before I chose a location. I’ll admit, it was sketchy in a few places. We came across a chop-shop being used in one of the abandoned warehouses, and within five-minutes of us being near it they shut down and moved the three BMW’s parked outside of it. Whoops? The plant was dark in a lot of spots, so I avoided the shadows. I may be a young adult, but I’m still afraid of the dark. I’m a pansy. I figured while I was there I might as well shoot some film, too. I also figured I could try some more double exposures, since I’m starting to get the hang of it. Tip: pay attention to the high lights and low lights of each exposure. I shot on expired Kodak Gold 400, I think circa 2007. I love the grain in the dark spots. We also took a trip to the Heidelberg Project, since it was just down the street from the Packard. If you ever come to Detroit, I recommend checking out the eastside. Despite it’s reputation, there are some interesting things to see in the way of urban decay and art.